Since last Friday, I've had a new friend. The Samsung Galaxy S8+, the larger and longer version of the Galaxy S8, has been my trusty companion for the last week. I'd like to use this diary on a daily basis to walk you through some of the new features of this powerful smartphone, as I discover them. The Galaxy S8+ is already receiving a lot of attention around here in the editorial office at AndroidPIT. It's interesting to see the response among those people who don't usually go for a top-end device like this one. As expected, the Galaxy S8+ was well received and drew many 'oohs and aahs' from within the team. My main suspicion that people wouldn't like the size of the phone was ultimately proven to be wrong. The huge, though impressive, display combined with its very thin edges and smooth shape creates the illusion that the device is smaller than it actually is. On an interesting side note, the Xiaomi Mi MIX prompted exactly the opposite reaction - everyone I showed it to thought the phone was way too big. As I began to actually use the device, one of my initial fears were confirmed; the new position of the fingerprint sensor is not optimal. Because the body of the device has been elongated, my fingertips are no longer immediately within range of the sensor. This could've been different had Samsung placed the sensor slightly higher in the body, nearer the camera. Perhaps I'll get used to this, though I doubt it. Nevertheless, I can still drool over the amazing display. I think it's great that the app drawer can be opened with a single swipe from the home screen. However, someone needs to tell the Samsung developers to add a function where you can swipe up or down to show your notifications. At the moment, this action only opens the app drawer - which is frustrating to say the least. As the upper bar is currently too far up on the home screen, this feature would be a very useful addition. Today, I want to share some thoughts with you on the audio capabilities of the Galaxy S8+. Firstly, some background information: Samsung purchased Edelschmiede / Harman Kardon as part of an enormous deal last year. By doing this, it also procured the rights to use headphones from Austrian brand AKG, which belonged to Kardon. The earbuds that come with both the Galaxy S8 and Galaxy S8+ are therefore also from AKG, and cost around $99. This provides an enormous sonic difference. Many manufacturers include cheap plastic headphones, or indeed none at all, even with their most expensive devices. These AKG earbuds however, look and sound great. The fabric cables are a nice touch too! That being said, there is a small unsightly detail where the display transitions into the frame at the top of the device. After only a few days, this area was visibly dirty - even around the internal speaker. This isn't especially unusual and happens often enough with other devices, though I'm still a little sad when a sleek new smartphone bears signs of use at such an early stage. It could be worse - a little dust is forgivable compared to, say, a large scratch. Bixby. The digital assistant that currently achieves next to nothing. Today, Samsung actually admitted that the voice commands from Bixby don't even work for the languages that have already been made available (English and Korean). Ultimately, what Bixby can do at the moment is present cards, notifications and Bixby Vision, which is an augmented reality camera for identifying objects in real time and then searching for them online. For what seemed like a lot of hype, Bixby is actually of very little use to the user, especially compared to Google Assistant, which is also installed on the Galaxy S8. And for this, Samsung included a new built-in button?! In my opinion, the company could have spared the effort and cost of this up-to-now rather useless element. Why you shouldn't judge Bixby just yet. Today I have to say a few words about the camera on the Galaxy S8+. Yes, I have to admit it, but I was a bit disappointed by Samsung's decision not to add a dual camera to the Galaxy S8. More than this, it also struck me as a bit strange that when the newest addition to the Galaxy generation was first presented, the camera didn't even get a mention. That said, after using the S8+ for a few days, I have to say: the camera is really great! It's faster than most other smartphones when it comes to focusing and capturing images, so it's really fun to use. The quality of the images is overall excellent, so you won't have to reinvent the wheel every time you want to capture a high quality picture. However, the Galaxy S8+ isn't in a position to compete when it comes to, for instance, the bokeh effect. The depth of focus on other smartphone cameras, like the iPhone 7 Plus or the Huawei P10, is much better. As they say, you can't have everything. Stop by tomorrow for more illuminating observations about the Galaxy S8+! "Stop by tomorrow for more illuminating observations about the Galaxy S8+!" It's been 7th "tomorrow" and still nothing new here! But you must keep in mind that the battery is not replaceable as is in Note - a deal breaker for many. Yes, in Korea where they have been out for a while the screens are turning red. They claim at this point it is the color module that is the problem, they are exchanging them. Why do you guys use the term "rushed to production"? It implies the manufacturer is stuipid and you have access to information they don't. Is there going to be more than 3 days of diary coverage? Hi Tyler, yes we will update this article very shortly to continue the diary! It's obvious to me that Samsung it trying to offer Google type services (BIXBY) because it is planning on leaving Android in the near future. As much as we don't like to admit it the success of Android is in large due to Samsung. Like it or not Samsung is the face of Android and that's a big chip to be holding. Google know's this and that's why the pixel is now here. Nexus was great but not enough of a market presence but Google is moving forward with the Pixel as a response to Samsung leaving soon. Google's 960 million investment in LG displays proves my theory i think. Why not use the best which is Samsung right, well I can't imagine Samsung selling to them if they are direct competitors. Samsung sells displays to Apple but that is a different story altogether. My prediction is Samsung and Microsoft are teaming up for something big and revolutionary but only time will tell if I'm right. Hint: it's not Samsung's Teizen os but a phone with full windows 10 with a docking station and universal apps. 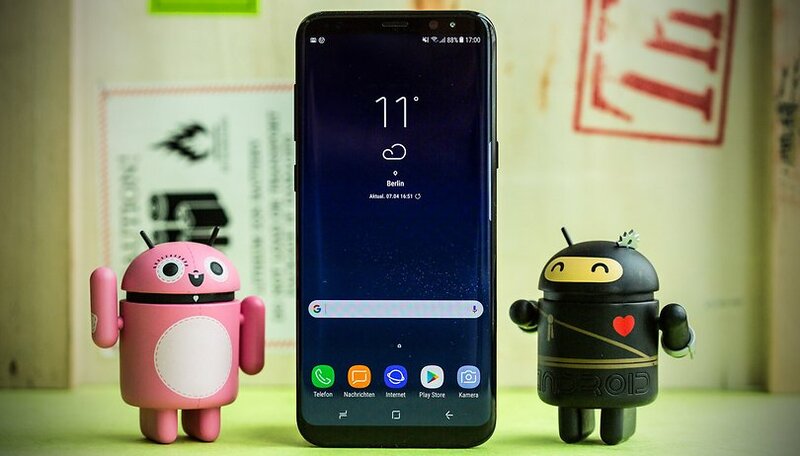 Even is that were true, Galaxy users and Note users will simply move to a different Android handset... Samsung would be stupid to partner with a company who has less than 1% market share in the mobile arena...The Android OS is the heart of Samsung's success, not their TouchWiz interface or Bixby... Samsung makes beautiful handsets with gorgeous displays, they aren't a player on the software side of things which is why Tizen never took off and even their own attempts at creating a music service failed... Samsung will likely continue making Android phones and maybe add a Windows 10 device that runs on ARM..Not one or the other. Actually Samsung owes their success to their hardware. For example look at the success of their smart watches which run on Tizen and not Android. Those watches are the de facto smartwatches for android users and the reason is the hardware and interface. Like it or not touchwiz is the mainstream interface for android not whatever flavor of stock android that the android Technocratics deem most pure. Without Samsung Android wouldn't sell nor enjoy its marketshare. Let's be honest how much coverage does the latest Samsung phone get vs the other OEM's? That's an interesting theory, Colin. Thanks for sharing your thoughts. I, certainly would have liked more info. Especially on the audio front. I'm sure the AKG earbuds sound great, but what about the phone audio internals? Does it have 32bit dacs? Hifi? Able to play high resolution music? I bypassed the LG G6 because the US variant did not have the hifi dacs that LG put into the V20. I'm currently using the ZTE axon 7, a great, fast, all around device with world class leading audio. And what about battery life? I think we can assume that the battery hadn't held out very well. But then i guess that's typical for the first few days of a new device. Yes, how is the day to day battery life, or does that fall under pre release embargo? Also, it would be nice to know how the speaker sounds, since that is it's job, rather than if it gets dusty or not. Despite thinking so for the first few days, I no longer think Samsung took such a bad decision with Bixby. The dedicated button serves two purposes: 1. Since the whole raison d'être of an AI assistant is ease of access as well as use, anything apart from a dedicated button would defeat that purpose. 2. By placing a dedicated button Samsung is trying to get its users to get used to Bixby rather than Google Assistant. Once users get the hang and habit of using Bixby, the gradual increase in the usefulness and capabilities of digital assistants that is inevitable will bring Bixby to the frontlines. Whether it can stand its ground in competition with Google Assistant is to be seen, however. That's an interesting way of thinking. Maybe you're right. By having the dedicated Bixby button, most people would just use Bixby instead of Google Assistant. Many people don't even know Google Assistant is a thing in their phone (or they just forgot about it). So by having a dedicated button for Bixby, it would surely capture the people's attention to use it more regularly and constantly remind the users that Bixby 'is there' in their GS8 and not to be forgotten with time. Having the dedicated button will surely make life easier to access Bixby. I read somewhere before that, with the Galaxy S8, Samsung is trying to create an ecosystem of its own. The prime example are Bixby, DeX and Gear VR. I think the reason why Samsung created Bixby is not only to rival other digital assistant, but rather, they can differentiate themselves from other brands and can make sure people would stay with Samsung for the long term. first app I'd install.. Nova Launcher, if only to get the swipe down anywhere for notifications.. Funny cos they put the Google search bar where it's easy to reach.. maybe Sammy doesn't think that easy notification access is that important.